Pablo Lorenzano, Lilian Al-Chueyr Pereira Martins, and Anna Carolina K. P. Regner, eds. The Association of Philosophy and History of Science in the South Cone (AFHIC) is a non-profit academic association, founded on May 5th, 2000, in Quilmes, Argentina, at the closing ceremony of the 2nd Meeting of Philosophy and History of Science in the South Cone. The creation of this Association was the result of the interest to deepen and strengthen the exchange between the researchers in Philosophy and History of Science from the countries of the South Cone, from the two first meetings that took place in Porto Alegre (Brazil, 1998) and Quilmes (Argentine, 2000) onwards. Since then, there have been biennial meetings organized as its responsibility. The main aim of AFHIC is to contribute to a better understanding of science from a philosophical as well as a historical point of view in the Spanish- and Portuguese-speaking countries, especially in those which belong to the American South Cone, promoting a space for reflection, exchange, discussion, communication, and dissemination of such an understanding. This volume is – with minor changes – the English version of Ciências da Vida: Estudos Filosóficos e Históricos. 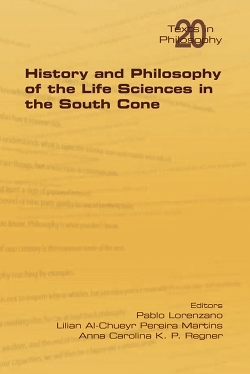 It is composed of refereed and, in some cases, opportunely modified contributions made by members of the Association of Philosophy and History of Science in the South Cone, some of them who are unfortunately no longer among us.